For a limited time only, Amazon is hosting a sale on a few of its Kindle tablets, but one in particular caught our attention more so than the others. 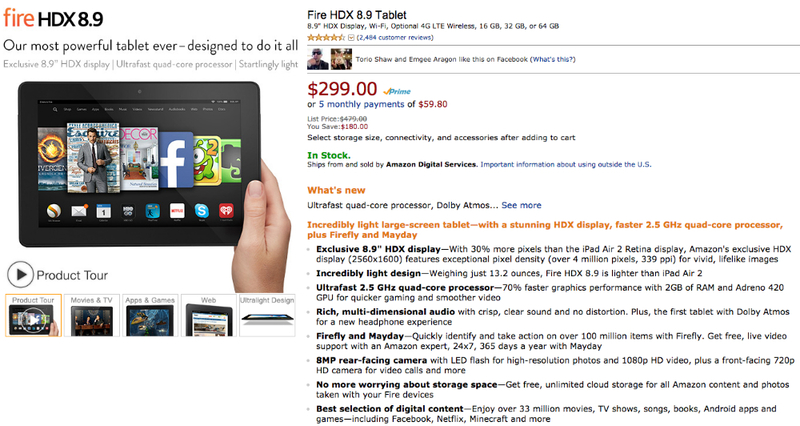 Priced at just $299, you can grab a Fire HDX 8.9 tablet, which is usually listed at $479.99. This tablet is one of the best hardware options that Amazon offers, featuring an 8.9″ HDX display (2560×1600), quad-core processor, 2GB of RAM, 64GB of storage, 8MP rear-facing camera, and a gang of Amazon features such as the Mayday Button. As mentioned, this is a limited time deal on Amazon, so if you think this might make for a good Valentine’s Day gift, here is your opportunity.